Wander into any town in the U.S., no matter how small and remote, and you’re likely to find at least one Chinese restaurant. In fact, there are more Chinese restaurants in America than McDonalds, KFC, and Burger King combined. And the food they serve is completely unlike anything you'll find in China. In this episode of Gastropod, we ask one crucial question: why? From the Gold Rush to MSG, via the scandalous story of gender-bending Chinese restaurants in 1920s New York City, this episode of Gastropod serves up a tasty buffet of American Chinese food. Grab your chopsticks and dive in! Inspired by the new documentary “The Search for General Tso,” directed by Ian Cheney and co-produced by Jennifer 8. Lee, author of The Fortune Cookie Chronicles, Gastropod embarked on a quest of our own to untangle the curious history of Chinese food in America. Things got off to an unpromising start: in the nineteenth century, the first wave of Chinese immigrants was greeted with deep suspicion and hostility by Americans of European descent. This mistrust extended to their food: the Chinese ate rice with sticks and, many believed, hid all manner of unpleasant meats in their dishes. A perfectly serious 1883 article in The New York Times began with the question: "Do the Chinese eat rats?" 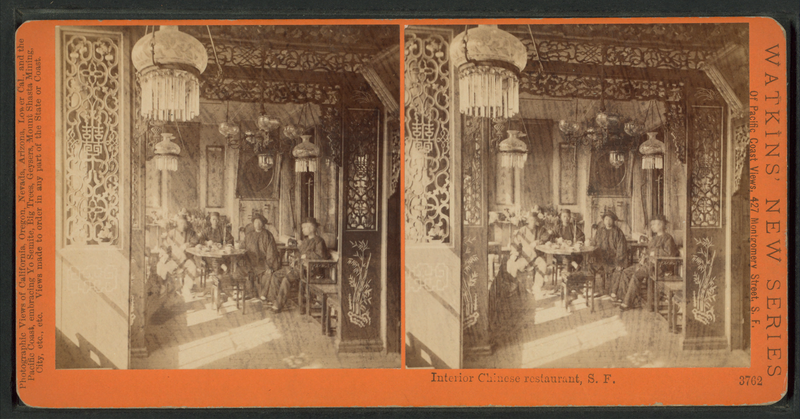 Stereoscopic view of the interior of a Chinese restaurant in San Francisco, in the 1880s, from the collection of the New York Public Library. 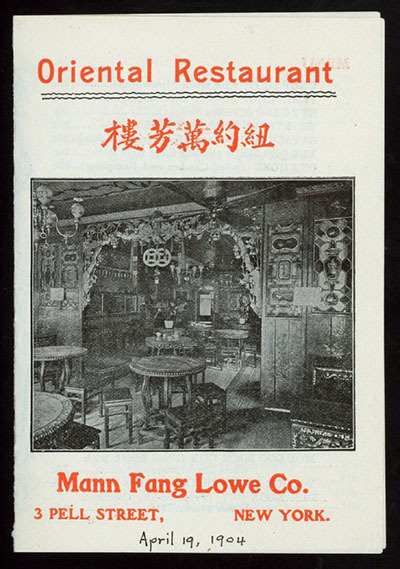 Below, Chinese restaurant menu from 1904, from the collection of the New York Public Library. And yet, between 1870 and 1920, the number of Chinese restaurant workers in America grew from 164 to 11,438. Why did Chinese immigrants abandon mining and manual labor to open restaurants—and, more importantly, how on Earth did these new chefs convince white Americans to eat their food? We speak with researcher Heather Lee, who discusses the loophole in American immigration law that unintentionally incentivized the Chinese to become culinary entrepreneurs. Meanwhile, with Jenny 8. Lee we explore the murky origins of chop suey, the dish that took America by storm, but one she considers "the best culinary joke played by one culture on another." By the early twentieth century, Chinese food was well on its way to becoming the most popular ethnic food in America. The same adaptive strategies that allowed them to bypass the racist Chinese Exclusion Act and reinvent their cuisine for the American palate continued to serve Chinese restaurateurs well throughout the twentieth century. In this episode, Heather Lee introduces us to the "dine & dances" of the 1920s—exotic, late-night Chinese restaurants in New York City where young people could experiment with new gender roles. Outside the context of their own cultural expectations, women flirted and couples kissed in public, shocking the city's anti-vice inspectors. American Chinese food's biggest headache arrived in the 1960s, with a letter to the New England Medical Journal blaming monosodium glutamate for a range of unpleasant symptoms. But is MSG actually harmful? We dig into the science behind "Chinese restaurant syndrome" to try to put the myth to rest for once and for all. It will take you five minutes or less and, in return, you will be entered for a $100 Amazon gift certificate and earn our undying gratitude: please take our completely anonymous survey now, so we can let advertisers know a little bit about you. The movie that inspired this episode of Gastropod! Ian Cheney's documentary (co-produced by Gastropod guest Jenny 8. Lee) is a funny and fascinating look at the story behind the most famous American Chinese dish of all. It was released earlier this year and is now available on Netflix, iTunes, Amazon, etc. Be sure to check it out! Guest Jennifer 8. Lee's 2008 book, The Fortune Cookie Chronicles, explores the many mysteries of American Chinese food—who invented fortune cookies? why is Chinese food so popular with American Jews?—but also tells the stories and struggles of the immigrants who cook, serve, and deliver it. Heather Lee is a postdoctoral researcher at MIT, working on a book about the Chinese immigrant experience, and Chinese restaurants in particular, in America. A fascinating talk she gave at MIT about her research on New York City's "dine & dances" provided one of the inspirations for this episode. In 2016, she'll be an assistant professor at NYU in Shanghai. With ice-cream episode guest Sarah Lohman, Jonathan Soma co-hosts the other MSG—the Masters of Social Gastronomy event series. He also runs the Brooklyn Brainery, and does lots of interesting things with data and code.